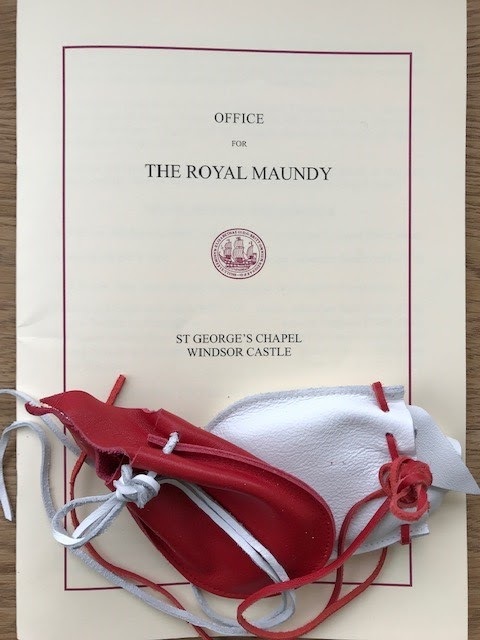 Two Readers (Licenced Lay Ministers) of our Diocese in Europe will be enjoying a very special Easter this year. 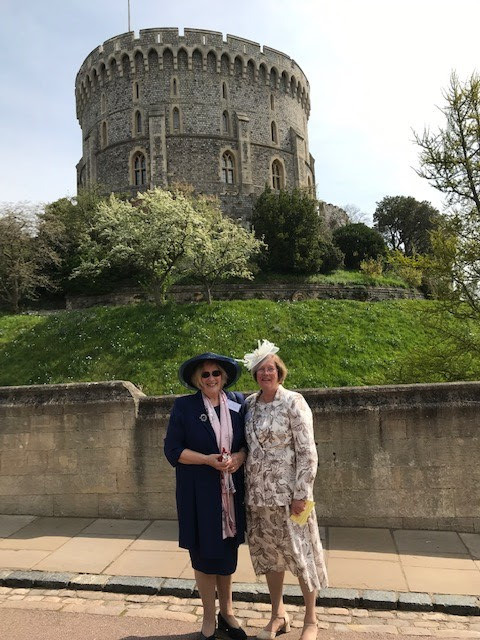 Angela Mirani, Reader in St John the Baptist Church, Varese, Italy and Celia Paterson, Reader in St George's Church, Madrid, were honoured by Her Majesty the Queen as recipients of the Royal Maundy money last Thursday, in St George's Chapel, Windsor Castle. 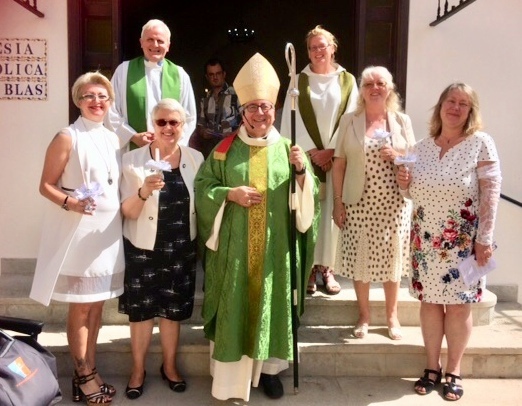 In addition to their long service to their own congregations, Angela and Celia play vital roles within their own respective Archdeaconries, and have served the wider Church also at Diocesan and international levels. Angela said in an email to me: "It was an amazing day: the service was beautiful and the music superb. A very emotional time". Warm congratulations to you both from across the Diocese, and Happy Easter! Maundy Thursday is the day in Holy Week when we commemoration the Last Supper of Jesus Christ, when he established the sacrament of Holy Communion prior to his arrest and crucifixion. So within the solemn rites of the sacred three days (Triduum) a central observance of the Holy Thursday liturgy is the commemoration of the institution of the Eucharist. 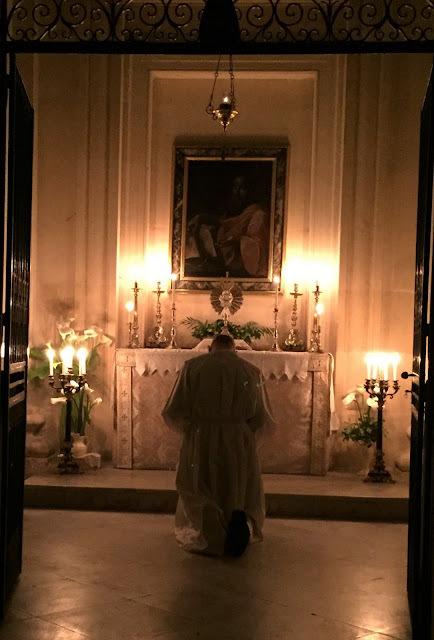 At the conclusion of the mass there is a procession with the Blessed Sacrament to the Chapel of Repose, where the Sacrament is present to remind us of our Lord's time in the Garden of Gethsemane where he prayed before his arrest and crucifixion. In the Christian tradition the faithful join in silent prayer, watching and waiting with Christ. In the Pro Cathedral of St Paul in Valletta, Malta, members of the congregation kept watch, and many others who may have entered the Church out of curiosity or simply out of a sense that Christians were observing something holy this week, joined with them, in quietness, in the presence of Our Lord. The quiet, prayerful tradition of the Church continues to be truly converting. 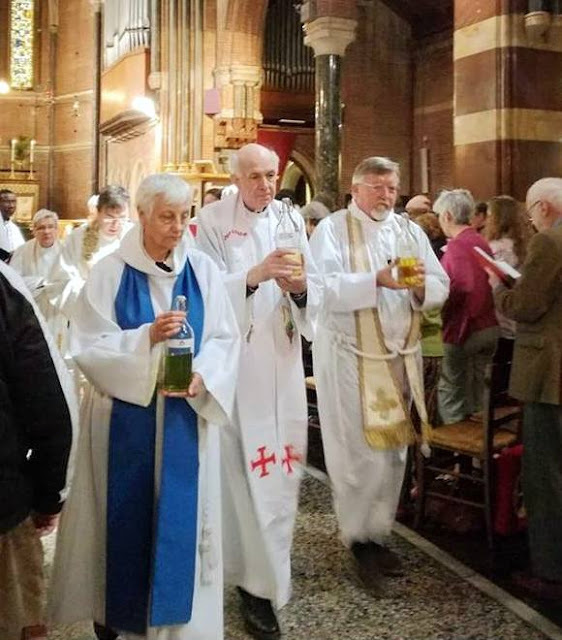 At the Chrism mass celebrated on Monday in St George's Madrid, the clergy, readers and lay faithful present also rejoiced in the collation of the Revd David Waller as a canon of the diocese. Canon Waller will occupy the stall of Blessed John Henry Newman (in the Pro-Cathedral in Malta). The new canon is the Chaplain of the Anglican Church in Palma de Mallorca, and an Area Dean in the Archdeaconry of Gibraltar. 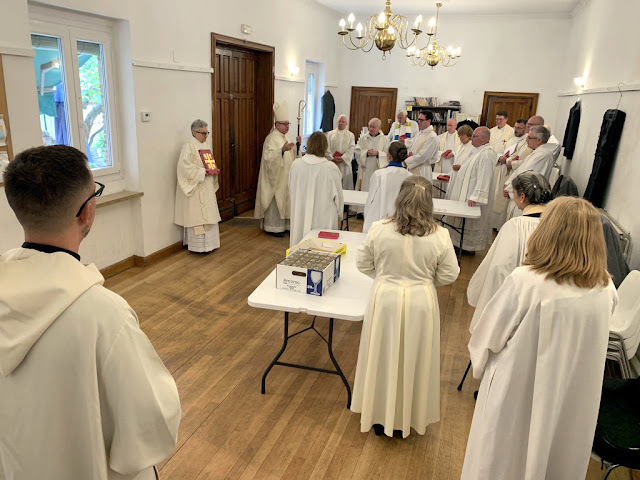 About 20 clergy and readers from Portugal, Spain and the Balearic Islands came together for the solemn ceremony of blessing the oils and renewal of vows of ministry. Many of the clergy and lay ministers met on Sunday evening for a dinner and companionship. It can be a lonely business, ministry, especially in the Diocese in Europe. It is good to take advantage of such times to get together for mutual support and building of colleagiality. 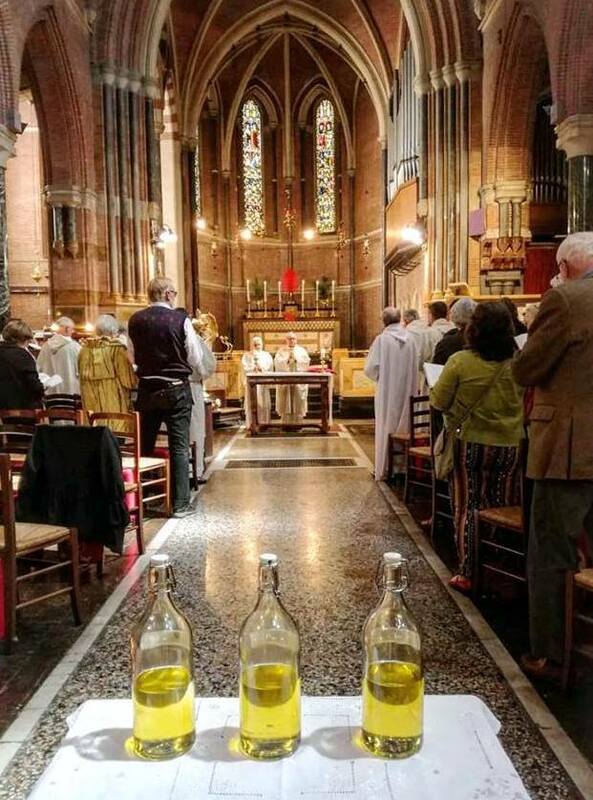 The most solemn moment in the rite of blessing the oils is the consecration of Holy Chrism. According to ancient tradition he priests join with the bishop in this prayer, signifying their unity in the sacred priesthood, and together they invoke the Holy Spirit on the fragrant oil which is used after baptisms, at confirmations and the ordination of priests. St George's hosted us very warmly. The Revd Dr John Kilgore, the locum priest, had only arrived a couple of days before, but together with Reader Celia Patterson and wonderful lay volunteers in the parish, we were given warm hospitality. The three sacred oils - for catechumens (those preparing for or about to be baptised), for the sick and the chrism - are distributed to the congregations of the diocese, having first been decanted carefully by Deacon Frances, one of her annual favourite jobs! In the above photo, Reader Celia Patterson supervises. 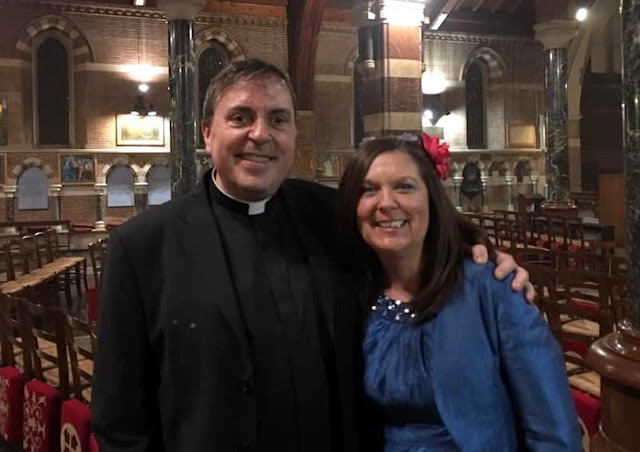 The Revd Rob Warren has been barely a month in post as Chaplain of All Saints Rome. He was rather dropped in the deep end by having to organise a major diocesan event in his parish - a Chrism Mass - which was celebrated last Tuesday. 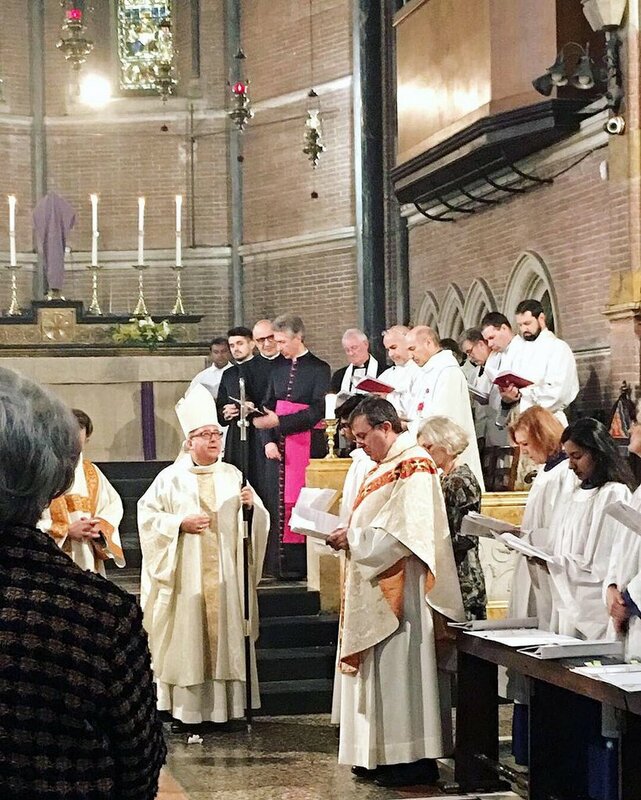 Clergy and readers, from Norway to Malta, attended the liturgy. A quartet of singers and the organist from All Saints provided a wonderful accompaniment to the service, and volunteers from All Saints laid on a light lunch for the 70 or so in attendance. Fr Rob and his team made us all feel very welcome. Such occasions go a long way in helping to address the isolation we can sometimes feel as clergy, especially in this diocese. The readings for the day provided a chance to reflect on the challenges of ministry in a secularised Europe, and to be encouraged for that ministry. God calls us through his Son to be leaven and salt, gentle agents giving life and flavour around us. As ministers, whether bishop, priest, deacon or reader, we committed ourselves, following our Lord, to reach out to strengthen the weak, to heal the broken-hearted, to lift up the fallen and to invite all to the loving arms of God. Deacon Frances and I represented the Diocese in Europe at the opening of the new headquarters of USPG (United Society Partners in the Gospel) in Trinity Street, London on 21 March. USPG is one of the oldest mission agencies of the Anglican communion, founded in 1701. Its predecessor, SPG, helped to found over half of the chaplaincies in this diocese. 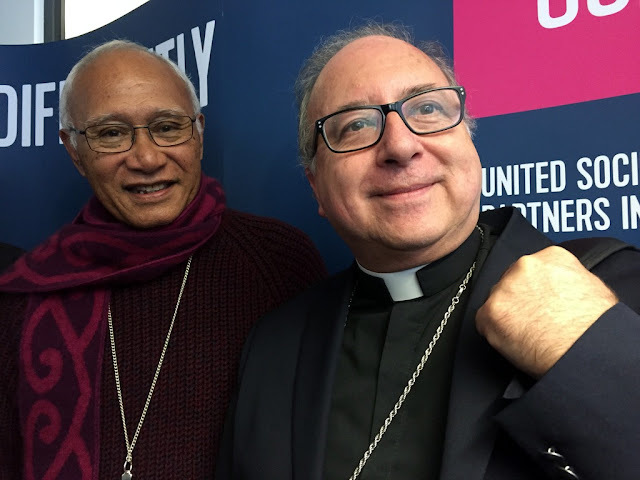 USPG supports the churches of the Anglican Communion in their mission to be communities of resistance and hope and in their witness to the healing power of Christ’s love. Thus it supports our work to address environmental degradation, turbulent global politics, gender injustice, and the forced displacement of people at record levels. USPG is a partner in the work of the diocese in its refugee and migrant ministry in Morocco, Greece and France. 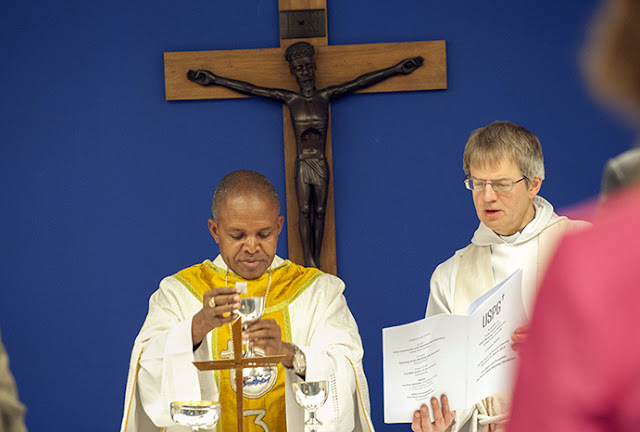 The opening of the HQ began with a mass and blessing of the chapel, presided over by Archbishop Maimbo Mndolwa of Tanzania. Readings and prayers were in English, Swahili, and Tagalog. It was a wonderful occasion enhanced by meeting some old friends, such as Archbishop Winston Halapua of Aotearoa, New Zealand and Polynesia, and the Revd Dr Michael Clarke, the Principal of Codrington College, Barbados. 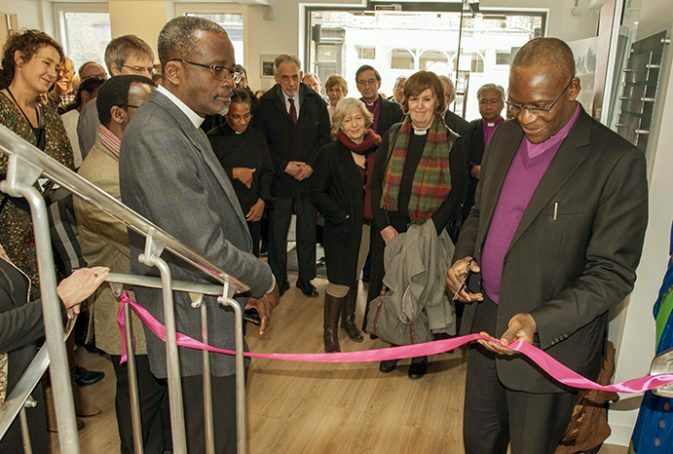 The ribbon was cut by Archbishop Josiah Idowu-Fearon, the Secretary General of the Anglican Communion. The Revd Duncan Dormor, General Secretary of USPG, said “Today, USPG begins a new chapter in its 318 year history as we begin to put down roots in this, our new home. We hope this house of mission and place of prayer will become a place of dialogue and discussion, and of hospitality and welcome for our many friends and visitors from across the communion". Blessed be God in the spread of the gospel to every race and every land. Blessed be God in the church of our day in its preaching and witness and its treasures of grace. Blessed be God who has called us to mission who forgives and who heals and is strength in our weakness.AMEN. A Canadian invasion in Rome? The Revd Rob Warren was licensed as Chaplain of All Saints, Rome on 9 March. He follows the Revd Canon Jonathan Boardman who had been Chaplain for close to 19 years, before his move to south London. The licensing service was a significant ecumenical occasion as well as an Anglican celebration. Representatives from the Roman Catholic, Orthodox, Lutheran, Methodist and other Churches were present, as well as the clergy and many members from our sister (US) Episcopal Church in Rome, other Church of England parishes in Italy, and the Interim Director and Deputy Director of the Anglican Centre in Rome. The diplomatic corps in Rome was well represnted too, both those accredited to the Holy See and to the Italian State. Fr Rob comes to this diocese from being the Rector of Christ Church Clermont-Ferrand, a parish of the (US) Episcopal Church in France. 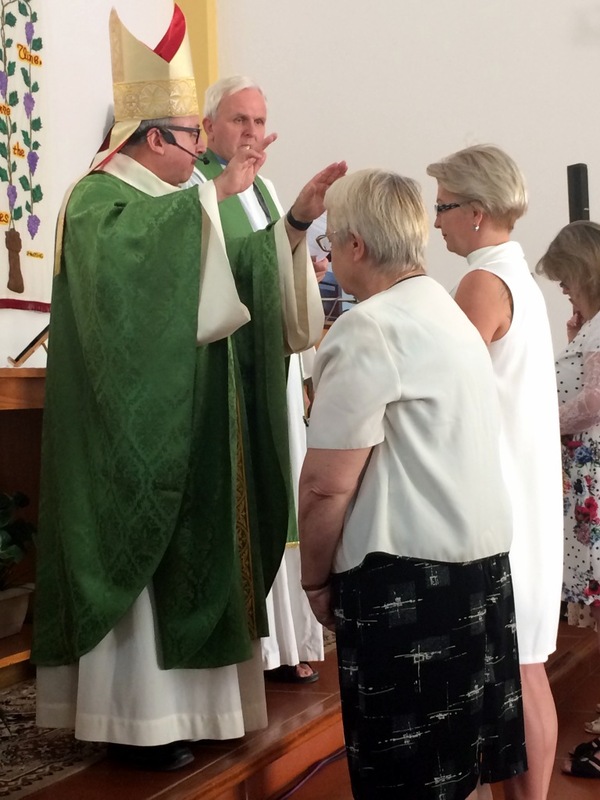 He has also served in the Scottish Episcopal Church (his wife Caireen is Scottish) and in the Anglican Church of Canada, where he served in the Dioceses of Montreal, and Moosonee. Both Caireen and Fr Rob are bilingual, French and English, and well on the way to learning Italian. It is a joy to welcome the Warrens to this diocese. All Saints is a very international community, with members and visitors from every (inhabited) continent. 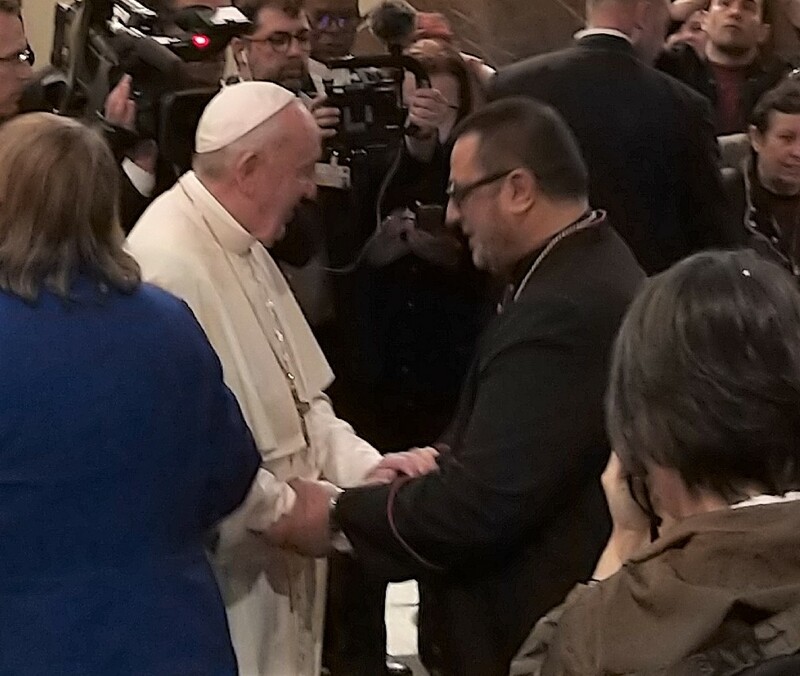 It also has an extensive concert programme and a twinning with a Roman Catholic parish in the city, Ogni Santi, providing opportunity for joint outreach in Rome. The Canadian Ambassador to Italy, HE Alexandra Bugailiskis, described the licensing mass as a bit of a "Canadian Invasion", with myself presiding and preaching, a Canadian priest being installed, and Ambassador Bugailskis joined by the Canadian Chargé d'Affaires to the Vatican, Isabelle Savard. On Saturday 6 April, a new Bishop in Charge of the Convocation of (US) Episcopal Churches in Europe, Mark Edington, was consecrated in the American Cathedral in Paris. Presiding Bishop Michael Curry presided, with another 35 bishops assisting. The preacher for the service was the Very Revd Dr Andrew McGowan, a well known theologian and liturgical scholar. In a stirring address, Fr McGowan declared that “Christendom is over, and this is not bad news. It’s good news. That’s over but the Jesus Movement isn’t over.” He turned to the bishop elect and said, “Welcome and go away, as God calls us to look out and not within". The ordination litany was sung in English, Spanish, Italian, French and German. The ordinary of the mass was a setting by Canadian composer Healey Willan! Unlike consecrations in the Church of England, the new bishop in the Episcopal Church receives a very impressive document certifying to his or her consecration. Participating bishops sign and add their seal from their own episcopal rings to the document. 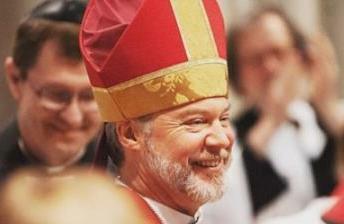 The Episcopal Church in Europe has about 20 congregations in France, Italy, Switzerland, Austria, Germany and Belgium. Bishop Mark succeeds Bishop Pierre Whalon as Bishop in Charge of the Convocation. 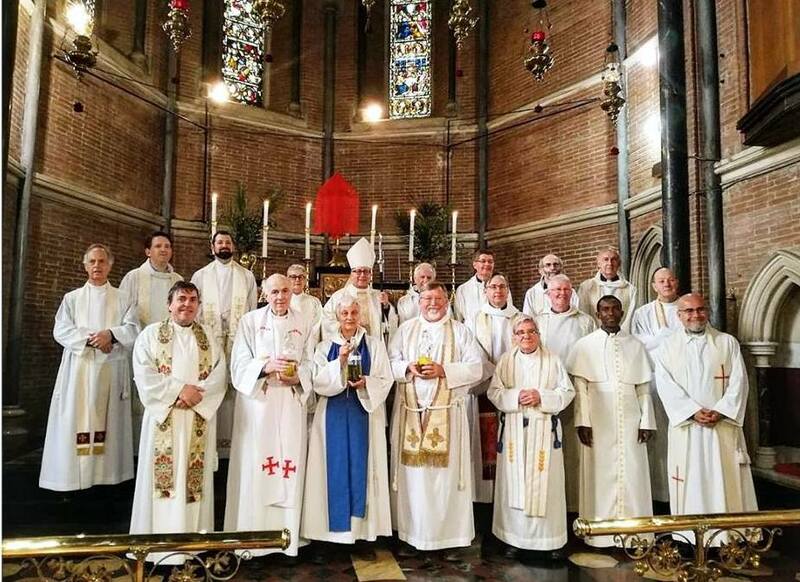 It is thus a relatively small jurisdiction in Church of England terms (the Diocese in Europe has about 300 congregations) but like our own Diocese in Europe is a multicultural and increasingly multi-lingual family of churches. Bishop Robert and I look forward to working with Bishop Mark in the years to come and we pray for him as he assumes his episcopal ministry. A particularly special confirmation celebration was held in March in the Anglican Church in Freiburg. Many members of the congregation received the sacrament of confirmation, including one of the children of the priest, the Revd Canon Christopher Parsons. 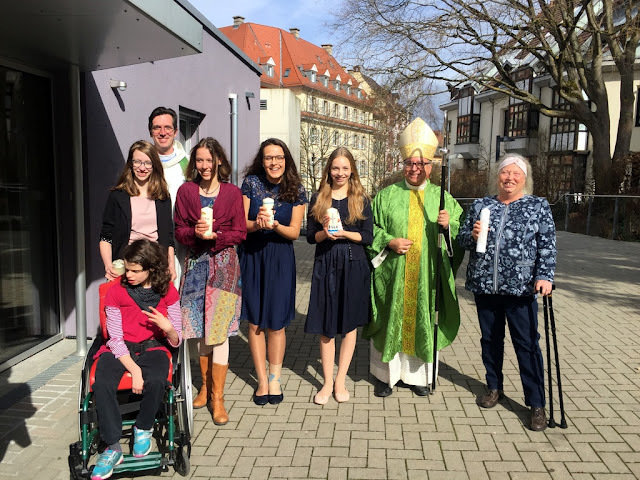 The Anglican Church in Freiburg is clear about its mission: "We are engaged in a lifelong task which is to build a community, made up of a wonderful mixture of ages and races, whose most abiding quality is ‘grace’," is an inviting statement from their website. It is evident that they are doing quite well in building such a community of grace, given the joy that I perceived at the celebration. 1. Welcome: offering broader options for migrants and refugees to enter destination countries safely and legally. 2. Protection: defending the rights and dignity of migrants and refugees, independent of their legal status. 3. Promotion: ensuring that everyone, migrants and local residents alike, can enjoy a safe environment in which they can develop all their gifts. 4. Integration: engaging in a process that enhances both the cultural heritage of the welcoming community and that of migrants, thus building an open and intercultural society. In St John's Casablanca our congregaiton is in the midst of a major development to construct a community centre to serve both the members and the Church's outreach to migrants. 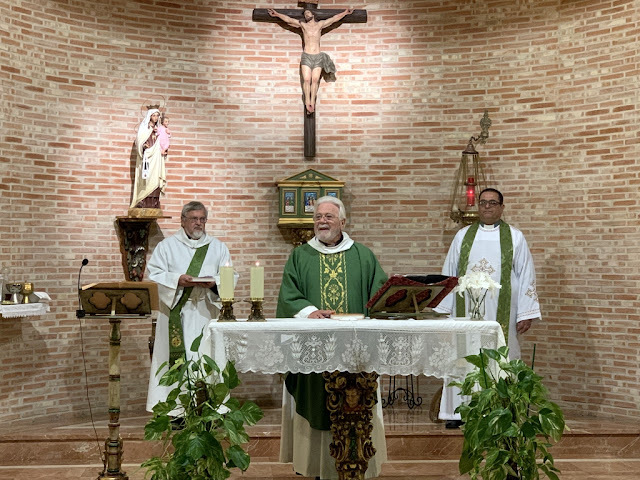 In St Andrew's Tangier, with the help of USPG, our priest, Fr Dennis Obidiegwu, serves both the European members and the more recent population of Sub-Saharan migrants and refugees. The Council of Anglican/Episcopal Churches in Germany, CAECG, is a unique body in the Anglican Communion. 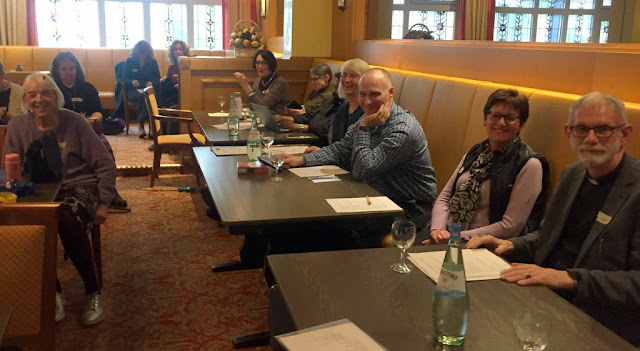 Here the congregations of the Church of England meet with congregations of the Episcopal Church (USA) in a joint consultative body, a synod-like structure, to support each other in a common life and witness in Germany. 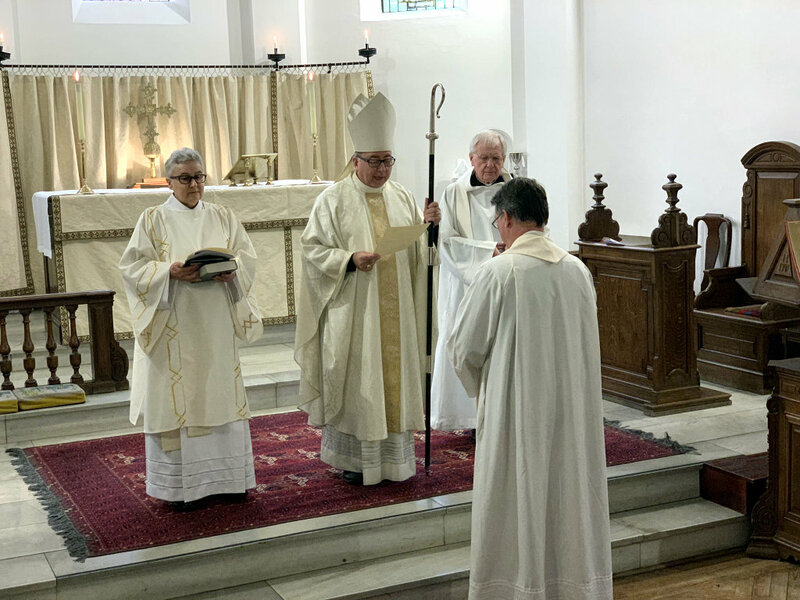 The Area Dean of Germany, the Revd Canon John Newsome, who takes on the role of Interim Archdeacon of Germany and Northern Europe on 1 April, (following the retirement of Archdeacon Colin Williams), was present for the sessions held in Treis-Karden on 8 - 9 March. During these meetings the CAECG explored a very current topic of debate in the Anglican Communion - human sexuality. I was invited to present an overview of the factors which enter into the debates across the Communion. The members of CAECG also heard the views of two of the Church of England clergy, the Revd Canon Martin Reakes Williams and the Revd Stephen Walton who spoke of why, from their particular theological tradition, homosexual activity, even within a faithful and stable relationship is rejected. 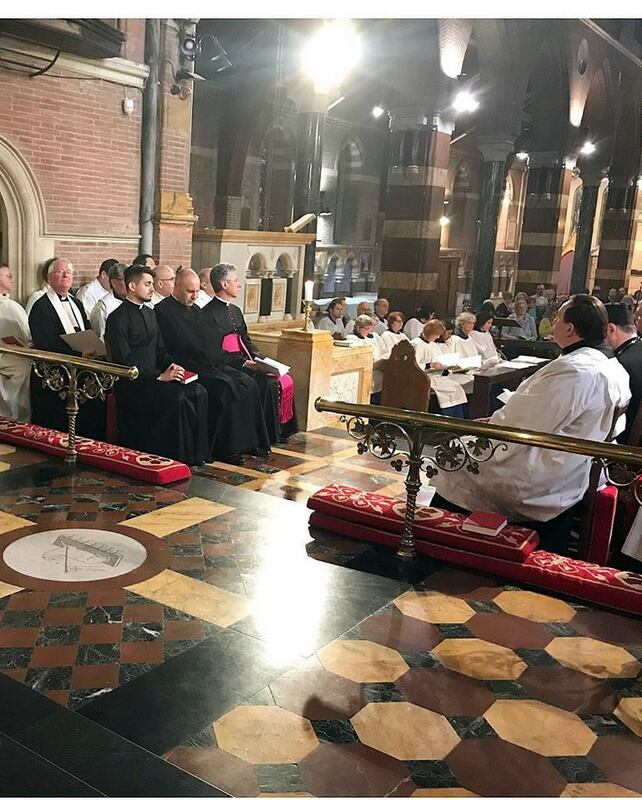 As one would expect, a wide range of views, theological opinions and experiences were held among members, but attentive and sensitive listening to each other marked the occasion. 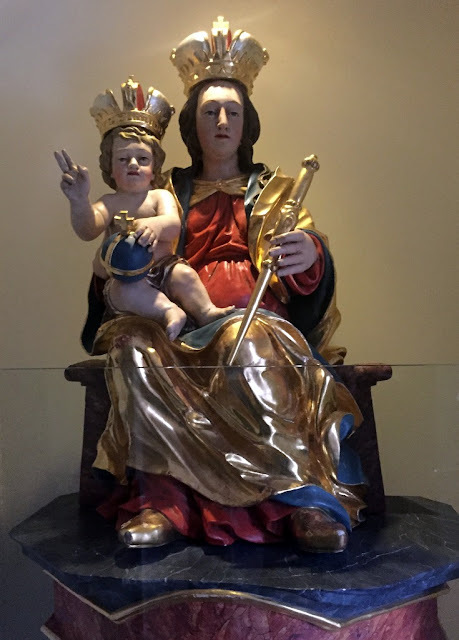 Perhaps the intercession of the Blessed Virgin Mary, whose image was enthroned in the hotel lobby where we met, was a help! The sacrament of confirmation is often associated in people's mind with a rite of passage for children and young persons. I have the privilege of celebrating the sacrament of confirmation with many candidates who are not children. 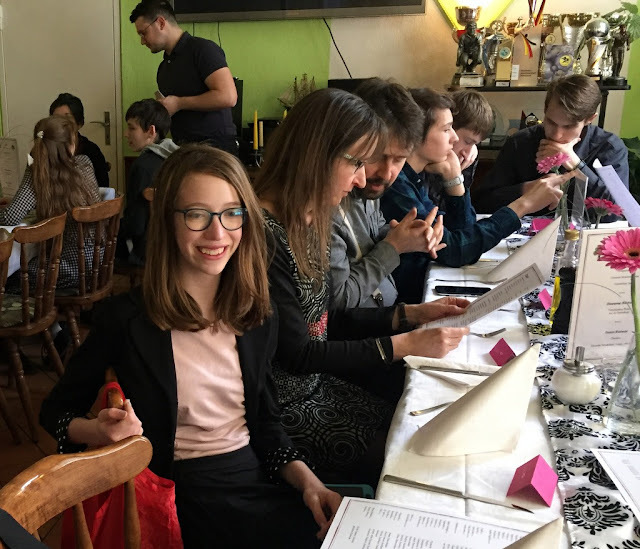 One of the remarkable features of this Diocese in Europe is that many people find that their experience of a community of faith provided by our churches opens up a path for exploring the meaning of their baptism and their calling as Christians. Participation in the liturgies, receiving solid and sensitive preaching and teaching, and sensing a welcome and acceptance by the community are all essential factors. For those who have never been confirmed, the sacrament provides a fitting celebration of their decision and commitment to walking together with their sister and brother Christians. I hear this affirmed in so many moving testimonies from candidates when I ask why they have decided to take the step of confirmation. Such was the case at a celebration earlier this month in San Blas, one of the congregations in our Chaplaincy of St Francis, Tenerife South. The Gibraltar Archdeaconry Synod is likely the largest of our Deanery/Archdeaconry bodies. It is also a surprisingly popular event. Many people volunteer and pay from their own pocket to attend, who do not have to be there by virtue of their licence or election. A rarity in the Christian world! 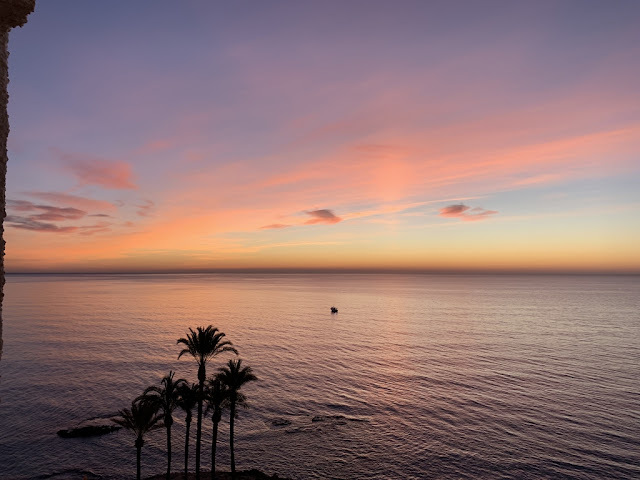 At its meeting from 3 to 8 February, near Torrevieja Spain, the Interim Archdeacon Geoff Johnston noted that there had been much change since the synod met last year, with a total of 9 new clergy appointments. As the Archdeacon is involved in all these appointments, this has been a busy year for him, in addition to his other responsibiliteis. 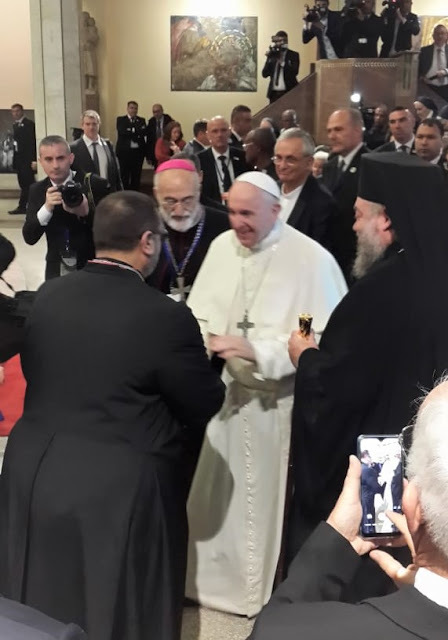 Also several new diocesan staff, including the Director of Communications and Bishop Robert's attaché to the European Union, Damian Thwaites, and the new Diocesan Secretary, Andrew Caspari, were introduced to the synod. 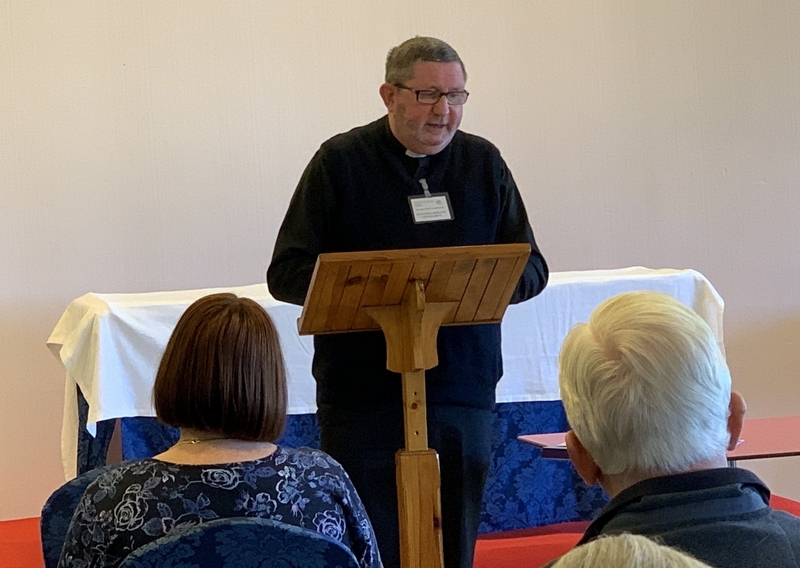 The clergy chapter, meeting before the whole synod, spent time exploring the Church's Healing Ministry, led by Fr Rodney Middleton of Holy Spirit Parish, Costa Blanca. 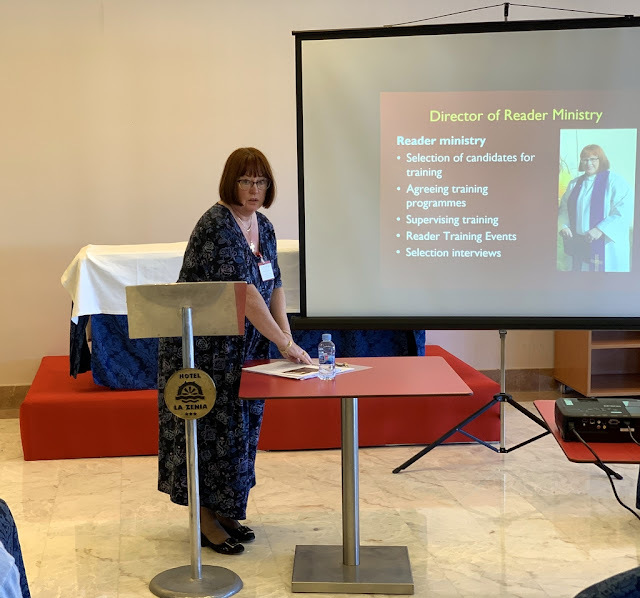 The clergy also had a session on Reader Ministry, introducing the updated Reader Ministry Handbook in particular, which was led by the Director of Reader Ministry Revd Canon Elaine Labourel. 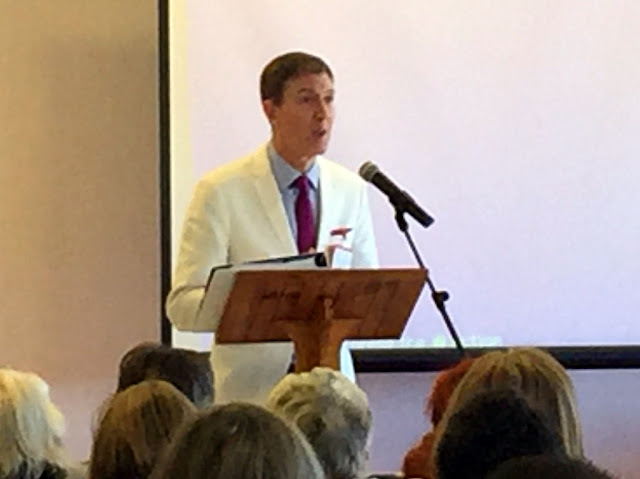 The whole synod enjoyed a presentation on aspects of ecclesiastical law by Registrar Aiden Hargreaves-Smith. 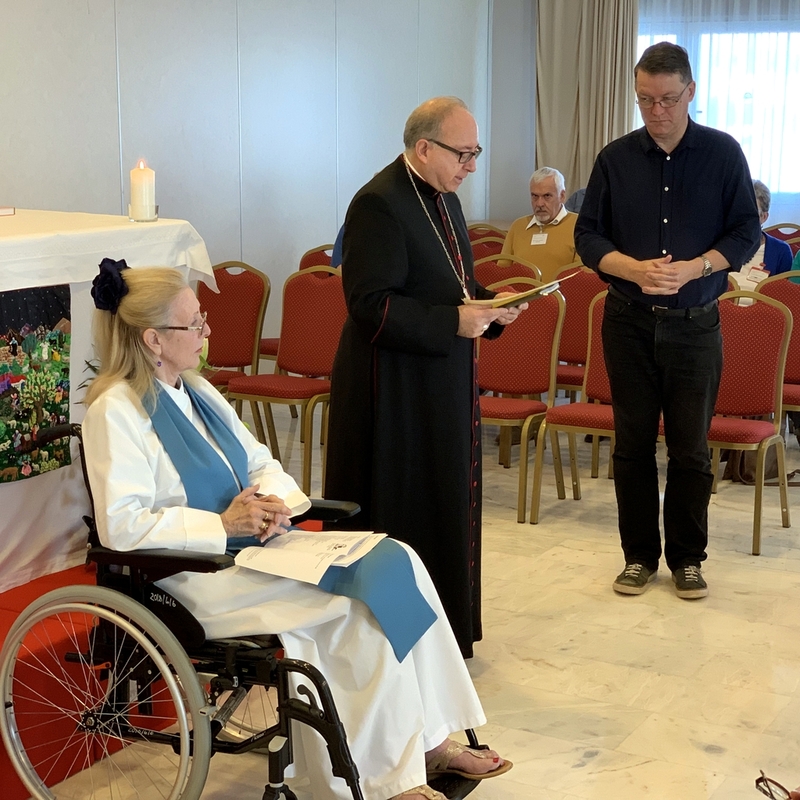 The Revd Canon Alan Bennett (Assistant Priest in Costa Almería and Costa Cálida) presided at one of the daily masses, celebrating his 50th year in the priesthood. I was also able to issue Fr David Waller with a fresh commission for his work as Area Dean. Fr David assists the Archdeacon in supporting the clergy and parishes in the Balearic Islands, and Catalonia. The ingredients for a good synod seem to come together in the Gibraltar Archdeaconry: excellent leadership and planning, stimulating speakers, inspiring worship, a congenial venue, and time for fun as well as for business.